If you’ve ever seen anime or lived in Japan when it’s cold, then you’ve likely heard of a Kotatsu. It’s a low table that stands no higher than a coffee table, but has a heater under it with a blanket cascading down from all sides. You can work on homework, eat dinner, watch TV or play video games comfy cozy in your living room without being constantly reminded of how cold it is outside. 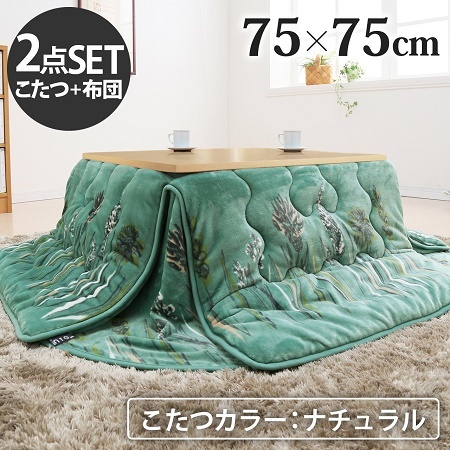 It is surprisingly difficult to find a full set, but this Kotatsu Table and Comforter seem to have all the bells and whistles intact. The table is 29.5 by 29.5”, standing just 15.7 inches tall. Despite being small, it weighs in at 35 pounds and the the futon cover is 70.1 by 70.1 inches, with a botanical design covering the polyester material. The top looks like Oak wood grain, and the legs are made of wood and rubber, hopefully meaning it’s sturdy enough to last more than a couple of years. The cord that comes with this little table is 9.2 feet long, meaning it should reach anywhere to power the heater. Winter would definitely be less dreary with this around, though really there are a variety of space heaters on the market to choose from. This one also costs around $691 before shipping, so it may be the better choice to go for something smaller or more specific in function, like foot or hand warmers. Of course, the novelty of this set would certainly be worth it if you’re willing to trade this out for your coffee table.